Midesk is a very small speaker that employs a Mivoc FR 358 N fullrange driver. Midesk has been developed by Bernd Timmermanns. 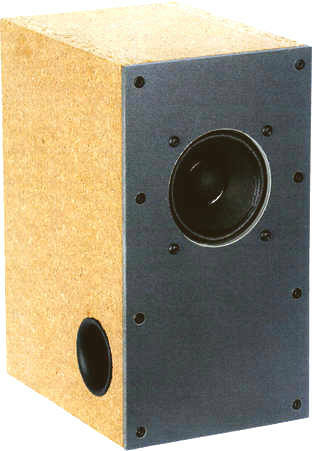 The speaker is built in bassreflex technology. The crossover consists of a highshelf-filter and a RCL curcuit in parallel to the fullrange driver. These are smoothing the frequency response and compensating the baffle step. Between 70 Hz and 10 kHz, the frequency response of this loudspeaker is nearly linear on axis. The decay spectrum is without fault below 10 kHz. At low volume, i.e. 90 dB at 1 m, the nonlinear distortions are below 1% above 400 Hz. Hint: In addition 10 pcs. of sink screws 4,5 x 50 mm for the front panel and 4 pcs. of screws M4 x 20 mm with nuts for the fullrange driver are needed. The high-end kit comes with MKP capacitors and uneteched electrolytic capacitors instead of etched capacitors for the fullrange driver. All inductances are baked varnished coils for minimizing microphonic effects. - The current flow through the coil creates a magnetic field which sets the reel of wire in motion. This motion induces a voltage in the coil which adds itself to the signal. The stiffer the reel of wire is, the less the signal will be altered.